The Toronto Cocktail is another delightful way to exploit your bottle of Fernet-Branca, this time with whiskey. The Toronto is basically a tarted-up Whiskey Old-Fashioned, and is structurally reminiscent of the Sazarac. Stir all ingredients with ice until very cold; strain into a chilled cocktail glass or Old-Fashioned glass. Optionally, express and garnish with orange. In the spirit of the drink’s name, I would think that a first-rate full-bodied Canadian whisky would work well in this drink, perhaps Wiser’s or Forty Creek. But having no first rate Canadians at hand, I went with straight rye. Embury’s ratio is 3 parts whiskey to one part Fernet-Branca, unusual for his normally whiskey-heavy stylings, and quite out of balance to my taste. The modern rendering is the 8:1 ratio, which tastes like it still has whiskey in it. 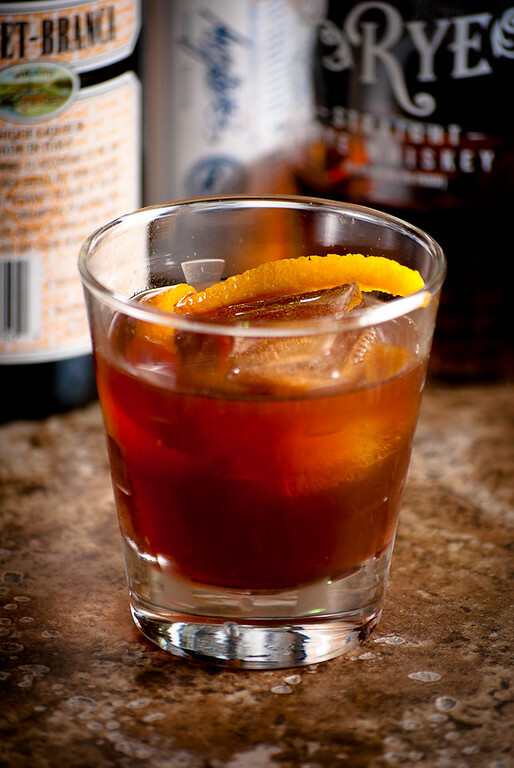 The orange garnish is often omitted, but it helps meld the flavors of the whiskey and Fernet. Be really careful not to overdo the sugar if you garnish—as with all Old-Fashioned variants, the border between Just Right and Cloyingly Sweet is vanishingly thin, and the orange can push this one over the edge. “Mixing with Fernet-Branca—the Toronto Cocktail” at cold-glass.com : All text and photos © 2010, 2013 Douglas M. Ford. All rights reserved. I purchased a bottle of this vile liquor and it reminded me of paragouric and scope. Thank you for the great drink. I used Old Overholt for the Rye Whishy and it was great. Yes, I think that menthol characteristic of Fernet-Branca is the part that is the hardest to work with, and the part that is mostly in the “acquired tastes” category. You really have to be in the mood for it to drink F-B straight, as a digestif, but it mixes so very nicely in cocktails like the Toronto. I’m glad you enjoyed yours. Just tried this with Rowan Creek bourbon, the Old Overholt is a much better choice, as the Rowan Creek is fine solo. Added a half shot of ginger liquor, very nice. A shot of F-B in a glass of strong ginger ale is awesome. Can’t find “Cold Glass” on Twitter. Hi, Garrett, I agree, rye whiskey seems the right choice for Toronto. Adding ginger, that’s an interesting amendment. I assume that would be in place of the syrup, so it doesn’t get too sweet? Thanks for the “gingery” ideas. Hi Doug, I just discovered your site (and instantly bookmarked it), so excuse the belated comment. This recipe is a slight variation on the King Cole, which appears in the Savoy Cocktail Book with rye, but originates with bourbon in 1917’s Recipes for Mixed Drinks. I’ve made it with Elijah Craig 12 Year and it was delicious. I’ve never tried the King Cole. I should, I suppose, since I enjoy Old-Fashioneds so much. I think it’s the fruity garnish that stops me—I just don’t have the patience to put lay in a lot of fruit and then do all the decoration. I could leave it off, but, well, that’s a Toronto. Making it with bourbon, though, that’s an interesting idea; perhaps I’ll give it a try when good fruit season rolls around. Thanks for the idea, and thanks for bookmarking Cold Glass! Hi Doug, wow….amazing recipe !!!. I come from a strange part of the world (75 miles from Italy) and in those “ancient” times, as teenagers…..we grew up with only three alcoholic drink choices, two of which were Fernet and Cognac (beer was non alcoholic, like O’Doul’s here). 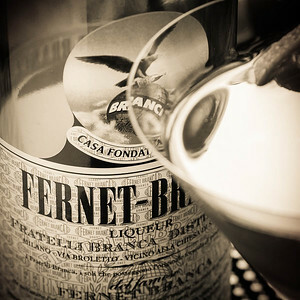 I considered throughout my adulthood as someone with Master’s Degree in Fernet Branca :). I have tried so many recipes – for years, but never achieved satisfied results. You made my “sufferings” come to an end. Mind blowing combo. Thank you. A “Master’s Degree in Fernet,” I like the idea. I’m glad you found the Toronto, it’s one of my favorites. I’m trying to imagine that bourbon-St. Germain-Fernet combination… The floral notes of the St. Germain would be interesting, but yes, that’s certainly a different, rather sweeter, drink. Thanks!